Note that many preferences are now set on a per-store basis i.e. each store has its own setting for some preferences. See the Virtual stores preferences section for more information. Preferences are used to configure some of mSupply's functionality to more closely match your needs. 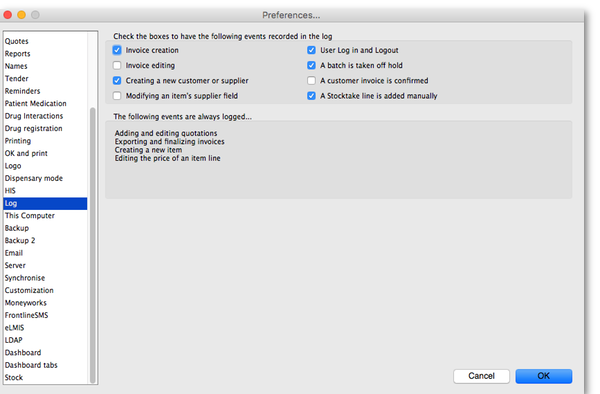 mSupply is very flexible and highly configurable so there are lots of preferences! To access them, choose File > Preferences… from the menus. There is a scrolling side bar on the left containing a list of tabs; click on the one you want to see the preferences on that tab. Organisation name: What is filled in here is quite important. Not only will it print on the top of invoices and various reports, but it is also tied to your registration code. Please think carefully about what it should be before entering it. If you need to change your organisation name, please do so and then re-contact info@msupply.org.nz for a new registration code. Address lines (1, 2…): Enter the address information about your organisation that you wish to appear on invoices. Clicking the Copy details button will copy this information to the clipboard, which you can paste into an email and send to info@msupply.org.nz. Once we have received this registration information we will generate a registration code and send it back to you. The code is entered by clicking the Enter code button in the window shown above. You will then be shown another window where you can enter the registration details you have been supplied: Your registration instructions supplied with the registration code will describe what information to put in each field. mSupply registration codes are specific to the Hardware ID, organisation name, Number of users and Expiry date of your licence (if it is time-limited - nearly all mSupply licenses are NOT time limited). If you change either your organisation name or the computer on which you are running mSupply, you will need to contact Sustainable Solutions for a new code. From version 3.85, the registration code depends on the machine UUID which is unique to every single computer and consists of 36. If your machine UUID is blank, please make sure that windows program CMD is allowed to run (it may be blocked by anti-virus or anti-malware software). Please make sure you keep mSupply as a trusted application and unblocked by any anti-virus or anti-malware software you are using. Disconnect any 3G USB dongles from the computer and restart mSupply. Proceed with retrieving the registration details as described above and send them to us to create the unlocking code for you. If the Hardware ID field is empty, for pre-3.85 versions this indicates that you do not have an Ethernet card or 3G USB dongle installed on your computer and for version 3.85 and above that mSupply or the Windows CMD programme is being blocked by anti-virus or anti-malware software. If you need help, please consult Sustainable Solutions. If you move your data file to a new computer you will need to obtain a new registration code from us and enter it within 3 months to prevent mSupply not working. This is a very important window and you must be careful to make the right choice! When a datafile is unregistered, synchronisation is prevented from running for data security reasons. Your datafile is just about to be registered so you are being asked whether you want synchronisation to continue working or whether it should be stopped. If you select “Stop Synchronisation”, then the synchronisation settings will be cleared and synchronisaiton will not work. You would select this option if you were using a copy of live data for training, for example. If you select “Keep Synchronisation working”, then synchronisation will keep working (surprise!). You would use this option if you were using this datafile in a live synchronisation system, either for the first time or if you've moved it to a new computer. When you have made your choice, type “I understand” in the textbox as confirmation (the consequences of turning on synchronisation to the live system for a duplicate datafile intended to be used in a training environment can be dire!) and click on the OK button. Whichever choice you have made, mSupply will now quit and you will need to restart it. Hooray, the registration process is now copmplete! Leave this field blank for normal operation. If you usually (or always) only issue to one customer, enter that customer's code here. You must set the value to the name code of an existing customer. Doing so will mean that this customer's details are automatically filled in when you create a new customer invoice. The percentage margin that will be filled in when you enter a new supplier. This value can be edited for each supplier at any time. Enter “0” if you do not apply a mark-up to items you sell (for example, if you are issuing stock to hospital wards at cost). The rate entered here will automatically be applied to customer and supplier invoices. Note that this amount can be edited when you are entering an invoice by clicking on the tax rate at the bottom of the invoice entry window. The Closed date is the date prior to which no transactions can be entered. Setting the closed date means that all transactions up to that date are finalised and mSupply will not allow the entry of any transactions with an earlier date. The closed date can not be moved backwards- only forwards. If you try to set an invalid locked or closed date you will be warned. Be very careful setting the closed date. Changes to the closed date can not be undone. This setting is only visible if you are using an mSupply client in a multi-user setup, not if you're using the single user version of mSupply (because it's not applicable to the single user version). This is where you set the time in minutes before the mSupply client is closed and the user is automatically logged out. To disable the function, set the time to 0 minutes (the default setting). This is really useful for preventing inactive users holding onto a user license when they've forgotten to logout of mSupply. But BEWARE: any unsaved work will be lost when mSupply is closed so remember to save your work regularly. The good news is that most of the things you do in mSupply are automatically saved as you do them (adding and removing lines to customer and supplier invoices, inventory adjustments, stocktakes etc.) so the chances of losing work is actually very small! Own code for electronic invoices The code that customers must have for your organisation in their copy of mSupply. This code is added to invoices you export, and allows customers to import the invoice into their system automatically. This is an old copy: warn me at startup. You may want to save an old copy of your data (for example the data as it stood on the last day of the financial year). If you check this box, you will be warned at startup if the database is an old copy, to reduce the risk of accidentally entering current transactions into an old file rather than your current file. Use a lock file to warn if data already open If this box is checked, mSupply will maintain a record of when it is open outside of the database. This option only applies to the single-user version of mSupply. This means that if a second user attempts to open your data file while the data file is already in use, the user will be alerted, and no damage to the data will occur. Note that this option only applies to the single user version of mSupply. The client-server version of mSupply allows multiple users to access mSupply at the same time. What if your machine crashes? If, for example, you have a power failure and your computer shuts down suddenly, mSupply will not be able to delete the lock file, and you will get a message when you attempt to restart mSupply that another user is already using the data file. If you are sure this is not the case, use Windows Explorer or the Mac Finder to locate the folder that contains your mSupply data. Delete the file that has the same name as your data file but ends in “_locked.txt”. You will now be able to start mSupply. We recommend you do not turn this option on unless you understand the above paragraph or have a system administrator who authorises your use of this option. An example of where turning on this option might be useful is when you store your mSupply data on a file server, and allow multiple single-user copies of mSupply to access the same data file. In such a situation to have 2 users attempt to access the data simultaneously would be disastrous. Item codes must be unique When this box is checked, mSupply will ensure that each new item entered has a unique code. Include catalogue code for item search When checked, a report can be produced where the item's catalogue code is one of the search parameters. Currency formats This option specifies the format in which currencies will be displayed in mSupply. We provide two preset formats for currencies with 2 decimal places and currencies with none. If you want to enter a custom format you can change the field below the drop-down list. For example you may want to use a different separator than a comma. Note that if you type illogical values into the field the numbers may not display at all, or display erroneous data. Contact Sustianable Solutions if you need more information. Service items Service items are items that do not have any stock associated with them. For example, a fee for special handling of goods, or for reprinting an old invoice, or a consulting charge. These Preferences determine whether new items are allowed to be service items or not. Note that changing this preference will not affect existing items. Name code for all codes to be unique (both 'store' and 'dispensary' mode) - If checked, when entering or editing a customer or supplier mSupply will not allow the creation of a second name with the same name code. 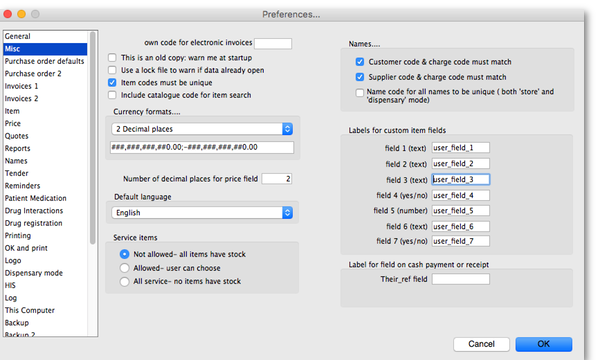 mSupply provides you with seven custom fields that you can use to record your own data for each item. Here you can specify the label(or name) for each field. Note that field one is also displayed when you list items. Note also that when using the search editor to search for items (for example when producing a custom report), the fields are labeled “user field 1” etc.., and not with the labels you might have assigned. The label of the Their ref field on Customer Receipts or Payments to suppliers can be changed to whatever you enter in this field. It is set to Cheque # by default. If you leave the field blank then the field label will be Their ref. There are 3 spaces for you to select the accounts to use. Choose one account for expenses when buying, one account for income when selling and an asset account for stock. The accounts you enter here will become the default accounts for newly created items. If you check this box, then the visibility of items in stores will be set to match the items on master list(s) selected to be used by that store. For details on how this works and how to set it up, see Controlling item visibility - the Master lists tab. This preference can drastically affect item visibility. For instance, if a store has no master lists assigned, all items will be made invisible in that store. Could lead to a scary moment! If some items that are currently visible in a store need to be made invisible when this preference is turned on but they can't (because they have stock, for example) then a temporary master list is created for each store containing the problem items. mSupply will inform you but you should use that list to deal with those items. If the box is unchecked then the visibility of items in a store is not affected by master lists. If you want item codes to be assigned automatically, check this checkbox. On checking the box for “Use customer price categories”, mSupply will activate the price categories. 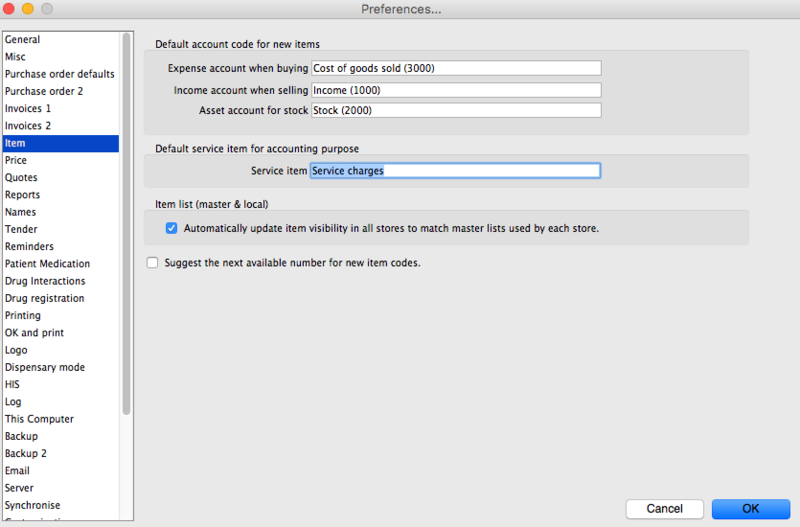 Here in the Preferences, you specify what percentage change to the default price will be made for each category. Suppliers in this list will have no price category assigned to the items they supply. To add a supplier in this list, click the Add supplier button. A window will appear with a space to write the supplier's name. You can write the first character or two and press enter/return to bring up a list of suppliers that start with those letters. You can then select your chosen supplier from the list. To delete a supplier from the list, highlight it by clicking on it and then press the Delete Supplier button. Check this box if you want a validity date for a quote to be compulsory. If you check this box then the preferred status will not appear when the validity date has passed. Check this box if you want negative stock values to be ignored on stock history reports (negative values can be legitimate but concerning for some users so negative values are left as zeroes if this preference is turned on). Default field name/Custom field name table: In this list you can change the labels for name categories and custom fields - not the categories themselves (see Name categories for instructions on how to do that) but the labels for the categories. To change one of the labels click on it in the Custom name column to select it and click on it once again to begin editing it. Type the new name and then click outside the label to finish editing it. Now, wherever you would have seen that label in mSupply you will now see the name you have given it. The defaults are shown in the screenshot above. Labels for custom fields on name category: Here you can enter labels for the custom fields used when creating or editing name categories. The labels you enter here will appear on the New/Edit category window instead of the Category_user_field_1 and Category_user_field_2 labels. These labels are used in some reports. Title: The title for the printed tender letter. If nothing is entered in here mSupply will use 'Invitation to tender'. Tender reference: The reference for the tender so that, when you communicate with others you both know which tender you are referring to. If nothing is entered in here mSupply will use 'Tender reference'. Click this to indicate that you operate an mSupply remote tender service where suppliers and you will log into a common web page to submit and download tender information. You will need to contact Sustainable Solutions for the account information required below before using this option. If this box is unticked you will need to enter bids manually. If it is ticked, you will see an extra Synchronise tab when you view the details of any tender. Client ID This is the ID that you use to login to the remote tender web page and is unique to you. This will be supplied to you by Sustainable Solutions. Password This is the password you use to login to the remote tender web page. Like the ID, this will be supplied to you by Sustainable Solutions. Tender Module Address The internet address of the remote tender web page in the format IP address:port number. Once again, this will be supplied to you by the indefatigable Sustainable Solutions. Reminders provide a simple to-do list built into mSupply. If the Show reminders on startup box is checked, any reminders that are not completed and whose due date has been reached will be displayed in a window when a user logs on. Here you can add a header and a footer that will appear on patient medication records. The number of days of patient history …. field determines how far back from the current date mSupply should look for drugs that have a known interaction with the drug you have just entered. When drug interactions are activated, you will be shown a warning message when you enter a drug on a patient invoice that interacts with other medicines dispensed to that patient during the history period specified. If you have a license for the Registration module, you will need to check this tick-box, and click OK in order to activate it. 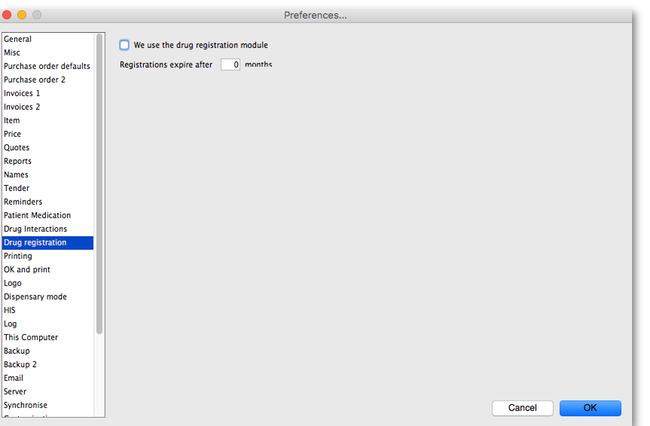 You can specify the number of months before a drug registration expires. So when you register a drug, the expiry date of your registration will be calculated automatically by adding the number of months you have specified to that day`s date. For example, if you specify 24 months until a drug registration expires and you register a drug on 24/07/2016, the expiration date will be set automatically to 24/07/2018. If you leave the number of months at 0, you will have to set the drug registration expiry date manually. For an explanation of this section please go to OK and Print. Here you can paste in a logo you have copied to the clipboard - you must copy the contents of a file to the clipboard, not the file itself. The file can be in .jpg, .png, .bmp, .gif, or .tiff format. This logo will be displayed at the bottom right of the navigator. Make sure the image you use is twice as wide as it is high. If it is not, mSupply will convert it to this ratio which will make it look squashed or stretched, sometimes with interesting results! If you have set a store logo (see here) for the store you are logged into this will be displayed on the Navigator and invoices instead of the one saved here. If you want the logo to be printed on invoices, check the checkbox. Please note that not all printing forms include the logo. If you would like customisation or assistance, Sustainable Solutions can quickly customize forms for you to meet your requirements. Message on labels The text you type here will be displayed on medicine labels on the last line. Custom identification code If you wish to identify the origin of the dispensed item, e.g. In-Patient Dispensary or Out- Patient Dispensary, create an identification code, and enter it in this field. It will then appear as the last item printed on the the right of the third line of each label. Printing options for units Three options are available from the drop down menu. You can choose to always print the units on labels, you can choose for each item whether or not to print the unit or you can choose to never print the units. Turn off cell padding in between direction and patient name mSupply will automatically pad the cell (leave some space in the cell) between Direction and Patient name. If you do not want this to happen then check this box. Print full prescriber name on label To have the prescriber's full name printed on labels, check the box in Print prescriber full name. Otherwise, the initials will be printed. Print organisation address 1 as separate line By checking the box Print organisation address 1 as separate line , you can print organisation address 1 as separate line . You have to set the text in Preferences: General »address 1 field. The text which you type here will be displayed on medicine labels on its own line. Print patient category on label If checked, when a prescription label is printed the patient's category will be printed alongside the patient's name in the following format; Patient name (category). Note that if the Print Patient code on label option is also checked then the patient's code and category will be printed alongside their name in the format Patient name (code/category). Print Expiry date of Item on label When checked, the item's expiry date will be printed on the label. Print Sales value of item on label When checked, the item's sales value will be printed on the label. Print Patient code on label If checked, when a prescription label is printed the patient's code will be printed alongside the patient's name in the following format; Patient name (code). Note that if the Print Patient category on label option is also checked then the patient's code and category will be printed alongside their name in the format Patient name (code/category). Print Batch on label When checked, the item's batch number will be printed on the label. Don't print placeholder lines If this box is checked, placeholder lines will not be printed. Print a receipt on labels by default mSupply allows you to print a patient receipt on a label; to enable this function by default, check the box Print a receipt on labels by default in Preferences:Dispensary mode as shown above. This has the effect of enabling the “Print receipt” check box in the Prescription entry window . Note that if the Print a receipt on labels by default is not checked, the function may still be turned on in the Prescription entry window. Default Patient category The text you enter into this field will be assigned to the category field for new patients. 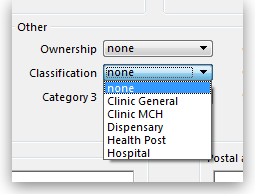 Default Prescriber name With the cursor in this field, enter the first letter or first few letters of the prescriber's name and press Tab. 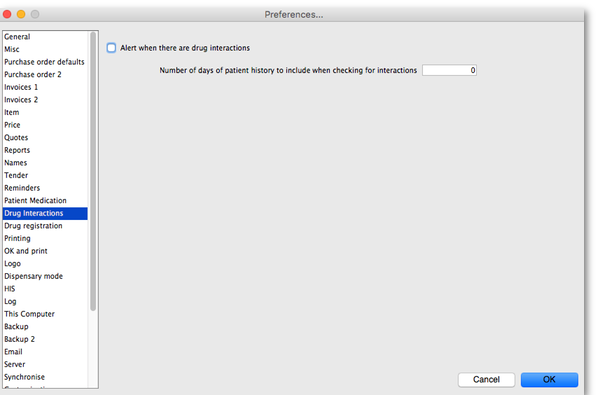 A window appears displaying prescribers who meet the criteria typed; note that both first and last names appear, and you should select the desired prescriber and click OK to make that prescriber the default one. Auto-generate patient code If this box is checked each new patient created will have a serial number assigned to them. The assigned code can be overriden by the user. Prefix codes with The text you enter in this field will be used as a prefix for automatically generated patient codes. e.g. if you enter “t” codes will be assigned “t1”, “t2” etc. Capitalise patient names Does what it says. The shift key will still override this option. Prescriber must be entered If this checkbox is checked, then the user will be warned if a prescriber has not been entered when they click the OK button for accept and print a prescription. Expand abbreviations in patient address fields In the patient address fields, any abbreviations will be written out in full instead of the abbreviation if you check this box. Share patient prescription over stores If this box is checked, viewing a patient history in one store will show transactions entered in other stores. This section gives you the ability to apply stock to placeholder lines on prescriptions. We know that in a fast moving dispensary it's sometimes hard to keep up with the stock coming into the dispensary so, sometimes you can get into the position where you physically have stock on the shelves to dispense to patients but you haven't been able to enter it into mSupply yet. mSupply allows you to keep dispensing by automatically adding placeholder lines to the prescriptions instead of normal stock lines. When you eventually enter the stock that you physically dispensed to the patients into mSupply, you need to allocate it to the prescriptions to keep your mSupply stock levels correct. This is the function to enable you to do that. Simply select the dates between which you want mSupply to look for placeholder lines on prescriptions by manually entering them in the From and To fields or selecting one of the preset selections in the drop down list. Then click on the Apply stock button. mSupply will then search for placeholder lines on prescriptions between the dates you chose. If it finds one it will attempt to replace the placeholder line with real stock from your store on a FEFO basis. If there is enough stock then mSupply will replace the placeholder with a real stock line. If there is only enough to replace part of the placeholder line then it will allocate what stock there is and will leave a reduced quantity placeholder line to represent the stock that still couldn't be allocated. The significant events which mSupply automatically logs are listed here. Additional events may be logged by checking the appropriate check boxes on this tab. Creating a new customer or supplier Whenever a new customer or supplier is created, their name and code will be recorded in the log. Modifying an item's supplier field The supplier field for each item can be used to determine to whom orders for goods are placed (depending on the type of order you generate). If you use this method, you may want to know if mSupply users change the preferred supplier for an item. User Login and Logout The log will record every occasion on which users login and logout. A customer invoice is confirmed When the confirm button is clicked, or an invoice is set to auto-confirm: the invoice number is recorded. Please contact us if you need more logging than is provided here. It is a simple matter to incorporate into a future version - the trade-off is that it leaves the potential open to create very large log files, which may be a problem for some users. Note - These Preferences are applicable only in single user mode; in client-server mode, the backup schedule is set on the server. To activate , the Automatic Backup checkbox should be checked, then the appropriate radio button checked to have automatic backups performed according to your requirements. This function allows a backup of your datafile to be made. There are two types of backup available. Local backups are made to another folder on your computer, or to a networked folder. Internet backup allows for your data to be copied from a special backup folder to a secure internet site.- this applies to both single-user and multi-user systems. You can perform a backup manually File> Backup as well as automatically. It is not necessary to quit the database before performing a backup. The settings in this window are to be used only for single-user mode. In client-server user mode you must set the backup Preferences on the server machine. Click the “Choose” button to specify the destination of the backup files. For added security, we strongly recommend you backup to a different physical volume from the one where your mSupply data is stored. We recommend running mSupply server as a Windows service. This allows automatic log on, and control of the starting and stopping of the server from command line tools that can be run when a UPS is shutting down. Please contact us for more information. Choose whether backups should be compressed or not from this drop-down list. Compact will give the smallest backup size, but it will take longer for backups to run. Fast is a compromise of speed and size. mSupply allows you to verify the data integrity of your main data file each time a backup is made. This is extra insurance against hardware failures and other factors that can lead to data corruption. Check this box to activate. Check the box to activate this preference. Email results of check… If you check this option Sustainable Solutions will receive by email a report of the data file verification each time it is run. Note that no confidential information is transmitted with the report. If this checkbox is checked, then if your data becomes damaged, mSupply will automatically restore the data from a backup and use the log file to restore all transactions between the date of the backup and the current date. Here you can set the secondary backup location. This is useful for making copies of just some of your backups that you can then upload to a cloud-based backup service for automated off-site backups. Checking this option results in mSupply trying to copy completed backups to another folder which you specify with the Choose button below. Fill in the Backup every …..th file… field with number of backups out of which one copy will be kept. That is, entering 7 will result in one backup per week being copied. You should now configure your online backup software to use the folder chosen as the secondary backup location as the source folder for backups. Note that if you have plenty of upstream bandwidth, you might simply wish to set your main mSupply backup folder as the source folder. The duplication and block-level comparsisons that services such as Spideroak use mean that it may be better for you to use uncompressed mSupply backups, as then only the changed portion of your data file will be backed up. mSupply now allows you to make up to 3 secondary backups to separate locations if you would like to. You can use 1, 2 or all 3 if you would like to. At least one is recommended for security purposes. If this is checked you will use mSupply's own internal email server to send emails. If it is unchecked you will use your own email server, the details of which you must enter in the Mail server name, Username, Password, Port and Use SSL fields. The name of your mail (SMTP) server. eg “mail.mac.com”. You can only enter this if you are not using mSupply's inbuilt e-mail server (i.e. Provide me with a mail server to send emails is unchecked). The username mSupply will use to authenticate itself to the mail server. Only needed if you are not using mSupply's inbuilt e-mail server (i.e. Provide me with a mail server is unchecked). If this is checked mSupply will use the Secure Socket Layer protocol to send e-mail. A more secure way of sending e-mails but only check this if your mail server can support SSL. Enter an email address you would like any response to come to. mSupply cannot send email unless it also has a return address for email. The text you enter here will be added to the end of all e-mails you send. You might want to put your organisation contact details here. It is generally poor etiquette to make your signature too long. A mono-space font such as “Courier” or “Monaco” is better for viewing text in columns, such as is produced by the automatic order generation in mSupply . However, visually it has less 'eye appeal'. When mSupply automatically turns an order for a supplier into an email, the text entered here will be put in the subject line. For example you might want to put “Acme Hospital order” to advise the supplier of its contents. Note that you can edit the subject line of automatically generated emails before you send them. This option allows emails generated automatically to be sorted alphabetically by item name before the email is created. If this option is left unchecked, emails will use the creation order of the order lines to create the email. These settings are all for mSupply's built-in webserver, which is used for things such as the Dashboard, mSupply mobile, online catalogue and the Customer interface. Note: To use this feature an additional license is required. Please contact Sustainable Solutions for further information. The web server can be set to start automatically when mSupply starts by checking the box, or manually as and when you use the service by clicking the button. If for any reason you want to take the customer ordering module off line you can choose a message to display for your customers. For clients connected via a web browser, this is the maximum period of inactivity, after which the client must log in again. Choose which store you want to be the default for the web interface (only applicable if you have more than one store). Be careful when changing this option because it will change the default store that all the web interfaces will use to get information from mSupply, not just one of them. This limits erroneous submission of too many orders. Choose the maximum number of orders that a customer can make. If they have reached the maximum amount, they will be able to create more when other ones are completed. This sets how long mSupply will keep trying to supply report data before it gives up and displays an error message. For an explanation of this section please go to Synchronisation. Should a client wish to have customised features which are specific to their version of mSupply, we are happy, whenever possible, to incorporate such features. If you are running such a customised version of mSupply, you will have received from us a Customisation code . To activate the customised features, that code must be entered in this field. If you use the superb Moneyworks accounting software, you can have mSupply directly input invoices into Moneyworks. Contact info@msupply.org.nz for more information on these options. Visit http://www.moneyworks.sussol.net for more information on Moneyworks, including a free demonstration version. The Moneyworks application must be installed on your machine, and this option establishes a link between mSupply and Moneyworks. Don't turn it on if you don't know what you're doing, or if you haven't set up Moneyworks as described below. Gold - select this option if the Moneyworks application you are using is the one installed on your computer. Gold Client - select this option if you are connecting to the Moneyworks application installed on another machine on your network. This allows for production of individual invoices, e.g. for non credit customers, who make cash purchases; if you have such customers, check this box , but if all your customers are credit customers, receiving monthly statements, it may be left unchecked. Enter your logon details to access the Moneyworks document that you want to access. If you are using a partitioned data center, enter your logon details to gain access to the partition where your document resides. If you are not using a partitioned data center then leave this section blank. You are connecting to a remote machine across a network. If you are on Windows or a Mac connecting to a local installation of Moneyworks, make sure this field is empty. The import into Moneyworks relies on using an import map. The map for supplier invoices must be named “si_import.impo” and the map for customer invoices “ci_import.impo”. These map files must be stored in the “Import Maps” folder inside the “Moneyworks Customer Plug-Ins” which is next to your data file. The advantage of using import maps is that it gives you flexibility in deciding which accounts will be designated for sales and purchases, and the way the fields exported from mSupply are used inside Moneyworks. If you would like sample import maps from Sustainable Solutions, please email us at info@ss.org.np. Once you have set up the import maps and turned on the “Link to Moneyworks accounting software” checkbox, mSupply will attempt to send invoices to Moneyworks that are finalised using the “finalise customer invoices” and “finalise supplier invoices” commands. Is Moneyworks running …… it must be! Make sure the correct I.P address is specified if connecting to a remote machine on Macintosh. Make sure any charge codes used are actually present in the Moneyworks data file you are using. We can supply a version of mSupply that automatically adds names to the Moneyworks data file if they aren't found when exporting, but this costs extra! Make sure that Moneyworks has open periods for the dates of the invoices that are about to be imported. If you still have no success, turn off the Link to Moneyworks. .. checkbox, and produce a file. Then manually import the records into Moneyworks using the File > Import > Transactions command (making sure you load the correct import map using the “Load” button). The file has errors, Moneyworks will give a more complete error report. Note that if export to Moneyworks is not successful, the transactions will not be finalised in mSupply, so you will not get invoices that are missed in Moneyworks. We are also able to provide a similar option to link with Quickbooks accounting software. Please contact info@ss.org.np if this is of interest to you. If you use FrontlineSMS for sending information to mSupply via SMS messages (using mobile phones), this is the tab where you enter all the settings. For an explanation of this tab please go to FrontlineSMS preferences. eLMIS is an LMIS tool used by some countries to collect and aggregate supply information from health facilities. If you use eLMIS, you can interface your mSupply server with it using these preferences. Use the eLMIS interface Check this box to enable the interface. Interface Folder Click on the Choose… button to select the main folder that eLMIS and mSupply will use to share data. Time between scans for new information from eLMIS Enter the number of hours mSupply will wait between checking the interface folder set above for new files to process. When the Use the eLMIS interface checkbox is checked it tells mSupply to check the Interface folder/Orders/Incoming folder every Time between scans for new information from eLMIS hours for new order files to process. Scan now button Click this to make mSupply check the Interface folder/Orders/Incoming folder for new files to process immediately. Useful if you have manually put a file in the Interface folder/Orders/Incoming folder and want mSupply to process it immediately instead of waiting for the Time between scans for new information from eLMIS interval set above to elapse. Send errors to this email address The email address mSupply will send any error information to. This would normally be the address of your eLMIS helpdesk. Server URL or IP: enter the URL or IP address for your LDAP server. Port no. : enter the port number your LDAP database is being served on. Each of the fields you tick the “Show” checkbox for will appear on the bottom of the supplier invoice line detail form when receiving stock. They will appear with the label you give them in the “Display name” column (click once in the column to make the cell editable then type the name). The values you enter in these fields (or select for the fields if it's one of fields 5-8) will be attached to the stock and follow it through the system. For full details see Custom stock fields.